As you’ve likely already discovered, starting university is a complex process that requires you to pay attention to forms, deadlines, and other conditions if you want to see your plans become reality. Getting into residence is no exception. Here’s what you’ll need to know about the process at Waterloo and SJU. St. Jerome’s is part of the University of Waterloo first-year residence guarantee. You’re assured of a spot in a residence on the Waterloo campus, but you have to meet the conditions and make sure you do your part, too. Here’s how it works. You must be admitted to a first-year program starting in the Fall term and accept your offer of admission no later than June 3, 2019. AND you must submit your Residence Community Ranking Form and a $500.00 non-refundable deposit by 11:59 pm EDT on June 3, 2019. The ranking form will be available February 1 and asks you to rank your preferences for the Waterloo residences that are included in the guarantee. Important: If you want to live at SJU, be sure to rank St. Jerome's University number one on your Residence Community Ranking Form. 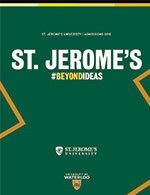 If you’re placed at St. Jerome's University, we’ll send you further instructions and details about our residence contract after you accept your offer of admission. We’ll also explain how to submit the Confirmation and Lifestyle Preferences form. It’s your chance to tell us about your personality and lifestyle, which we’ll use for roommate selection, as well as details about your room-type preferences, accessibility needs, dietary restrictions, allergies, medical conditions, and any other relevant factors. If you do happen to miss the residence application deadline (oops!! ), you can complete a Community Interest Form. We’ll contact you if someone has a change of plans and a space becomes available. We’ll use the information from your Confirmation and Lifestyle Preferences form to determine room allocations. If you’re living away from home for the first time, you might be a little nervous about sharing your space with a roommate. You’ll be glad to know that our hand-matching process will increase your odds of a positive relationship. And you might also like to hear about the countless students before you who have found lifelong friendships in residence. Drawing on their extensive experience in guiding and supporting students in residence, our Residence Dons do their best to find compatible roommates based on similar interests and lifestyles. But they rely on what you tell them on the Confirmation and Lifestyle Preferences form that you submit when you’re confirming your place in the SJU residence. So this is the time to be honest about yourself! If you and your friend want to live together, we’ll try our best to have that happen. If you’re both offered a space in the SJU Residence, and you’d like to room with each other, both of you should indicate your wishes on the "Roommate Selection" tab of the Confirmation and Lifestyle Preferences form. We’ll make every effort to grant your request. Room and roommate allocations are completed at the end of August, just before the beginning of the fall term. When you join us on move-in day, you’ll find out which room you’ve been assigned to and who your roommate will be. If you have accessibility needs or other special circumstances, we want you to know that our goal is to work with you to help you participate in campus life to the fullest extent possible. We hope you won’t hesitate to request information, housing, and support that will accommodate your needs. Our first recommendation is that you start the conversation as early as you can when you’re considering studying at Waterloo. That way, we’ll have ample time to explore the possibilities together well before the beginning of the term. You might find it valuable to arrange a tour of all of the Waterloo residences before determining which one can best meet your needs. As soon as you’ve been admitted to the University of Waterloo, you should visit the Accessible Housing website to find out more about requesting appropriate housing accommodation. If you’re not sure about the type of housing you require, they can help you work with the staff at each specific residence. Apply to the on-campus housing choice that you’ve determined would best suit your specific needs. If you require attendant services, you should also apply to the Independent Living Centre of Waterloo Region. Accessible Housing can assist you with this step as well. You should be prepared to submit information outlining the rationale for your specific housing request, accompanied by supporting documentation from a medical professional, clinician, etc. Important: The Accessible Housing office will work in collaboration with the Housing departments for all of the Waterloo residences in an attempt to meet your needs. Therefore, prior notice of your particular circumstances is appreciated and required by the University so that we can support you in the best way possible with your transition to campus and so that we can accommodate your needs in a timely fashion. All documentation should be submitted no later than June 3 in order for it to be processed. Priority for single rooms is determined based on medical necessity and requires supporting medical documentation. If you need a single room, you should vist the Accessible Housing website and make arrangements well in advance of move-in day. We are able to accommodate a wide variety of special dietary concerns and allergies. Let us know if you have any questions and we would be happy to help!